Surprising, perhaps, given the current Pestonian economic conditions, that more retail outlets haven't gone under in small market towns. Gone from Woodbridge are Woolies, of course, Jumper and the odd shoe shop. Would have taken a miracle to save Loaves & Fishes. Newly arrived have been the likes of Fat Face and Caffe Nero, while Oxfam has upsized its secondhand book shop. Be sure to Gift Aid. That list of casualties includes Pickwicks, famed for their four egg omelette. 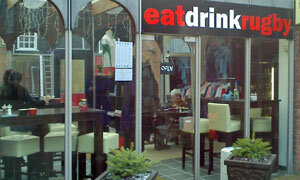 With Mr Pickwick decamped, that Gobbits Yard gap has been filled by a curiously named new eatery -- Eat Drink Rugby. Oh-kay: we'll give it a try. Memorabilia is everywhere, with framed photos, balls and shirts to buy. If there's a book on our table, we'd expect it to be about preserves rather than a guide to the World Cup. No matter, let's order. Soup or sarnie is simplicity itself: bacon & blue cheese for him, chicken & pesto & leek for me. Served with a manly ramekin of crisps, our sandwiches with their unlikely union of fillings are really, really good. Well done, five points. There's brief mention of why Jonny Wilkinson now plays in France -- er, the money -- before our rugger convers(atio)n flags. Let's do a Frangipani and re-seat elsewhere for pudd. Past the well-stocked fridge of Cokes, J2Os and beers and into the boudoir, the inner sanctum, the pimped-up beating heart that is the telly room. Must be a right scrum in here when there's a match on. Claiming the squishy corner sofa, you feel like Clockwork Orange's Alex involuntarily watching the endless lineouts and hand-offs on the widescreen. Physical effort to pull ourselves away long enough for good coffee and brownie. Props to the enthusiastic and chatty lady running the place and hope she manages to stay onside. If it was a car -- Fiat Punto. If they were passing by -- Mark Bailey.